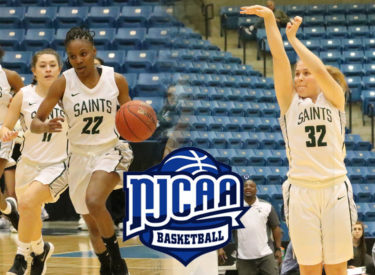 LIBERAL, Kan. – Though basketball season may be over, two Lady Saints are still being recognized as Mollie Mounsey and Sylvia Veloso were named to the NJCAA Region VI 1st Team on Monday after leading Seward to both a regular season conference title and the first Region VI Championship since 2007. Mounsey was second in the region in scoring, finishing with 18.9 points per game. She was earlier named the Jayhawk Conference Most Valuable Player for the second straight year. Mounsey started all 35 games for the Lady Saints. She becomes the first Lady Saints to be a two-time 1st Team All-Region selection since Rachel Barnes accomplished the feat in 2009 and 2010. Mounsey finished her illustrious career with 1,360 points – second most in Seward County history – and 256 made three-pointers, a Seward County and Region VI record. Veloso finished tied for first in steals with 118, good for 3.4 per game. Her steal total put her with the seventh most steals in a single season in Seward County history. Veloso was a do-it-all player for the Lady Saints this year, averaging 8.1 points, 3.9 rebounds and 3.9 assists to go with her 3.4 steals per game. Seward was the only team to have two 1st Team All-Region VI players, while Mounsey was the lone two-time All-Region selection of the 15 players named to the All-Region teams. Butler’s Ericka Mattingly, Hutchinson’s Jada Mickens and Cowley’s Kaitlyn Potter rounded out the All-Region First Team.